Organize your tennis knowledge ! 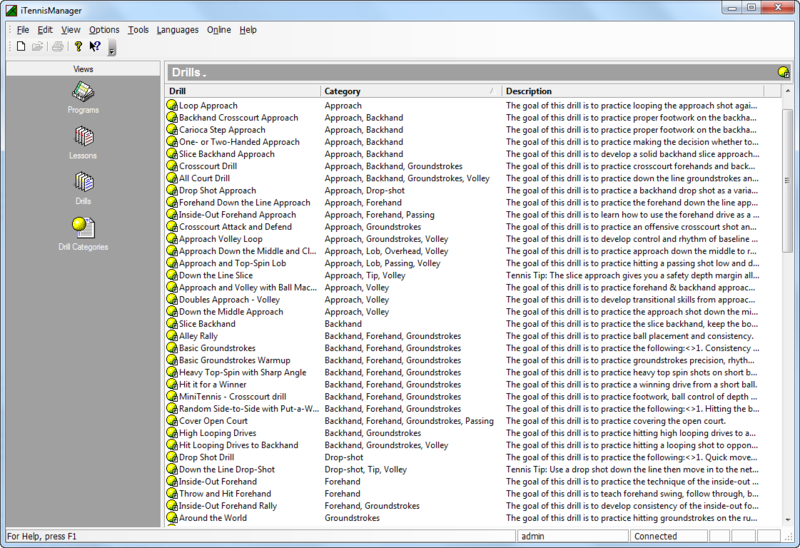 Over 100 tennis drills included ! Order your copy today Purchase Now ! 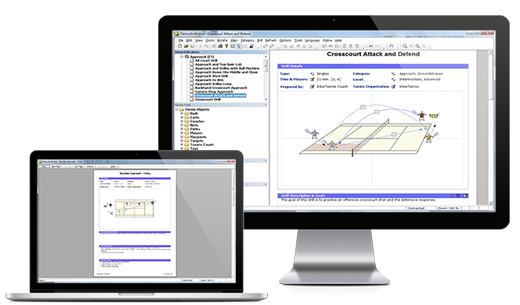 The iTennisSystem™ is a software package that enables you to illustrate, organize, and manage your tennis instructions using intuitive graphics and tools. 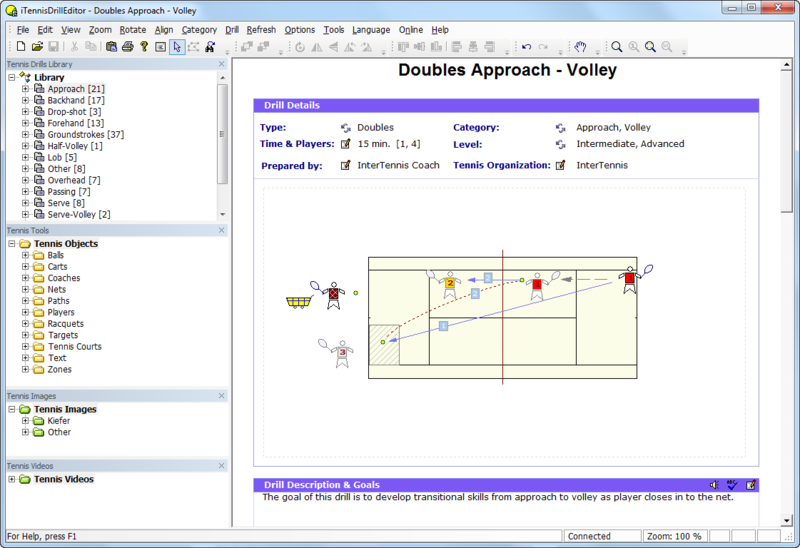 The package includes over 100 free drills from beginner to competitive level. You can easily modify and adjust these drills to your own training sessions and programs. 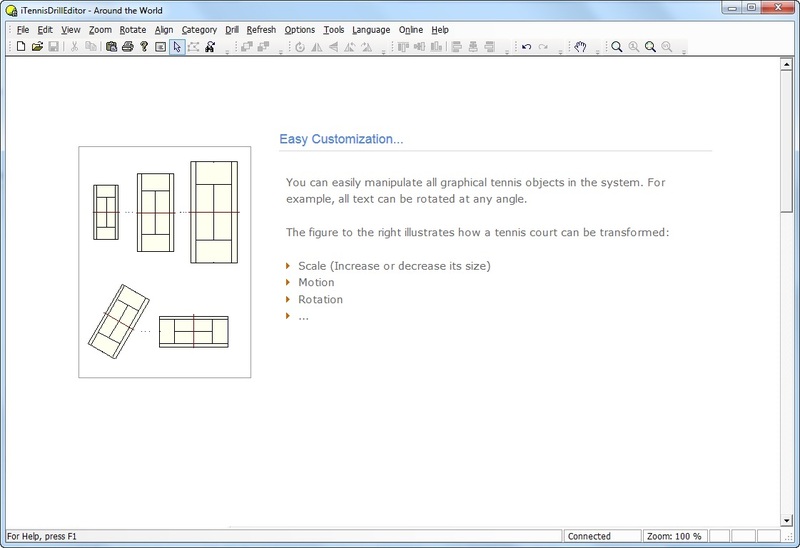 The 2D, 3D graphics, images, and text capabilities, allow you to create rich tennis drills in only a few minutes. 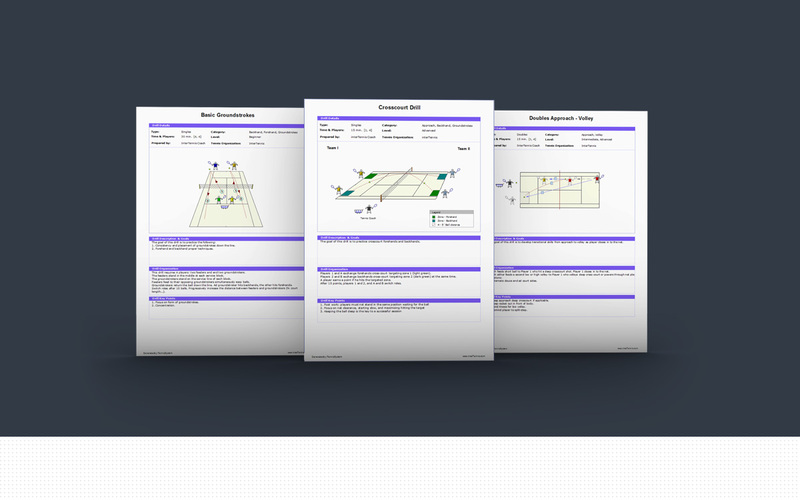 Enables you to put your tennis knowledge and experience into a tangible format, the iTennisSystem database and the printouts you generate. 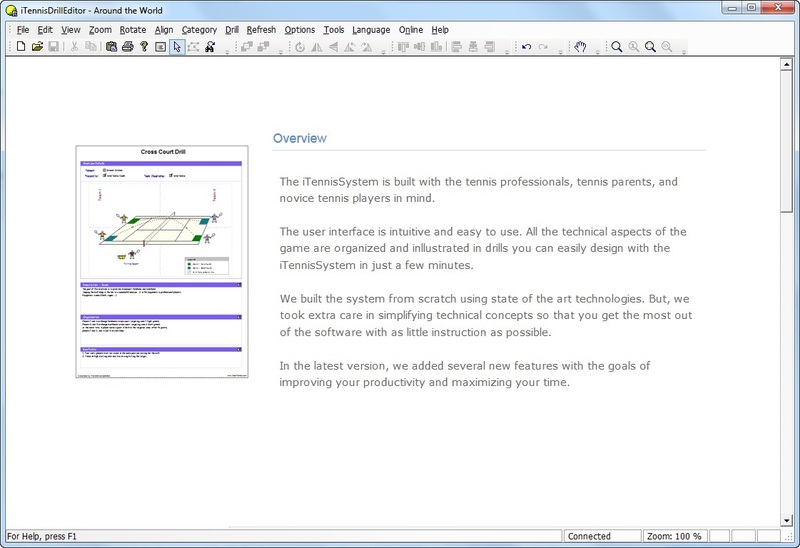 The iTennisSystem helps you organize your tennis knowledge. You can easily find drills that match your students needs thanks to the iTennisSystem's advanced sorting, and categorization capabilities. 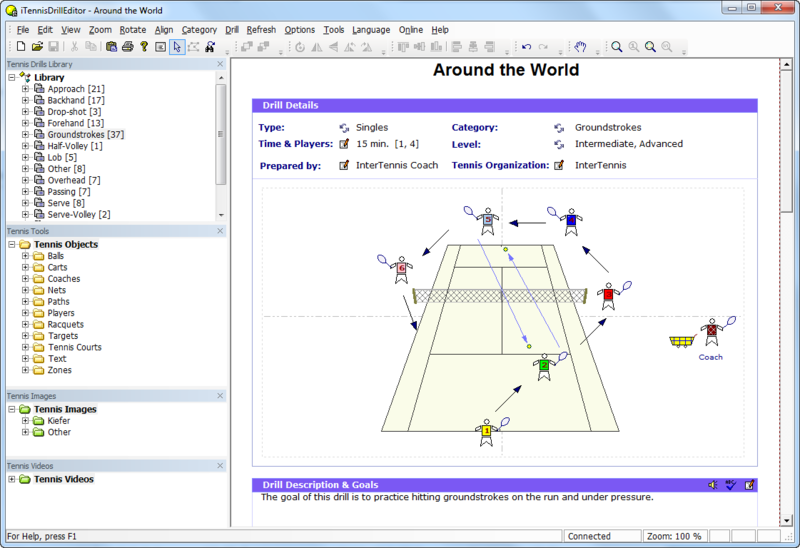 The printouts generated are professional reports that can be presented to tennis students, colleagues... to illustrate your ideas and help you communicate. 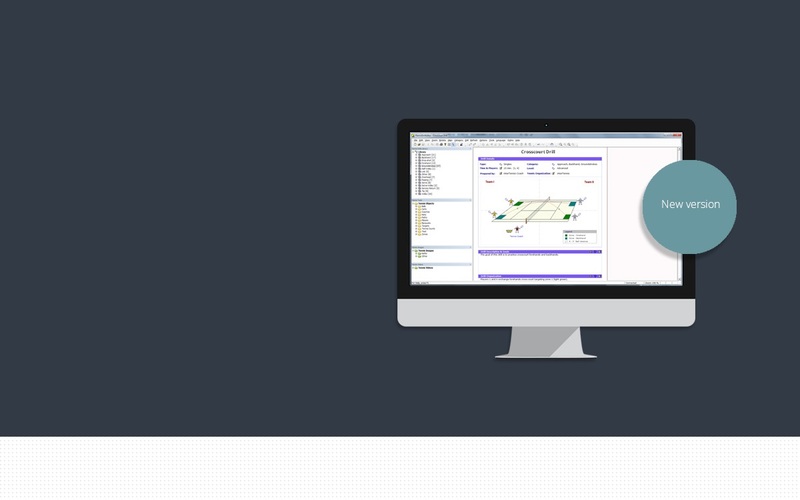 Give your audience an elegant and professional summary of your drills composed of graphics, text, and videos. 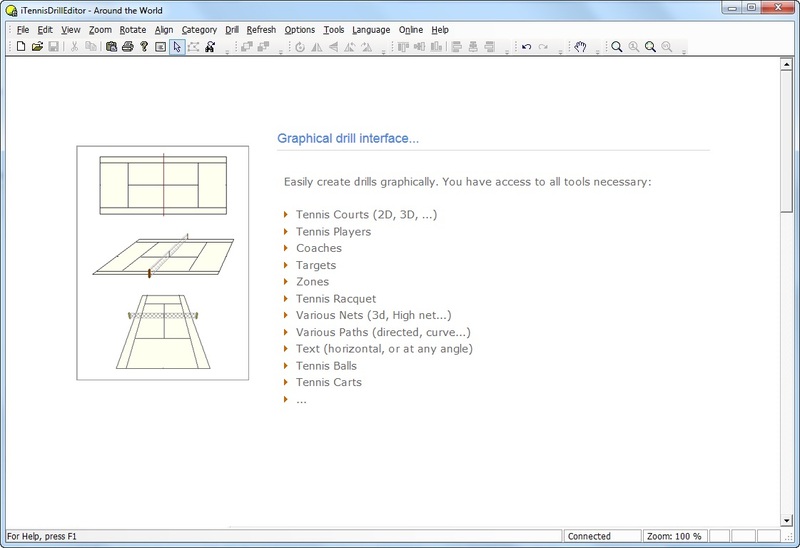 The iTennisSystem includes a graphical drill editor, which allows you to create a tennis drill through easy to understand text, graphics, images, and even videos. The user interface is easy to use. 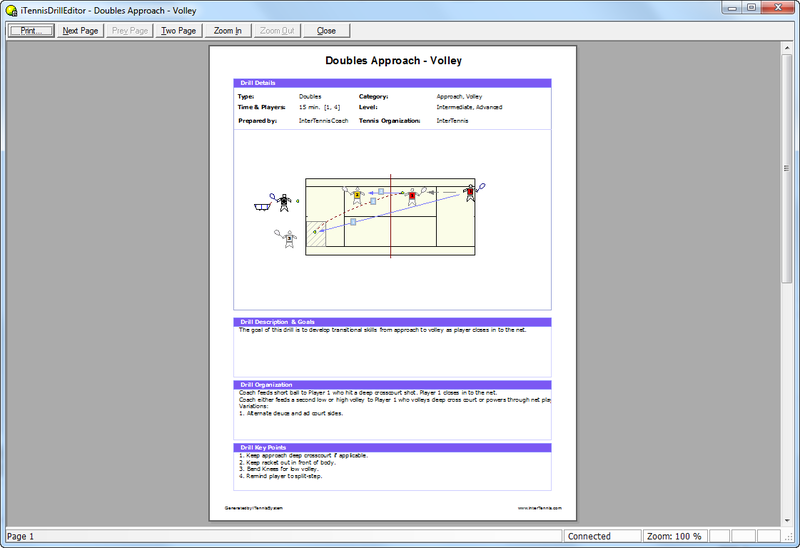 All the technical aspects of the game are organized and illustrated in drills you can easily design in just a few minutes. 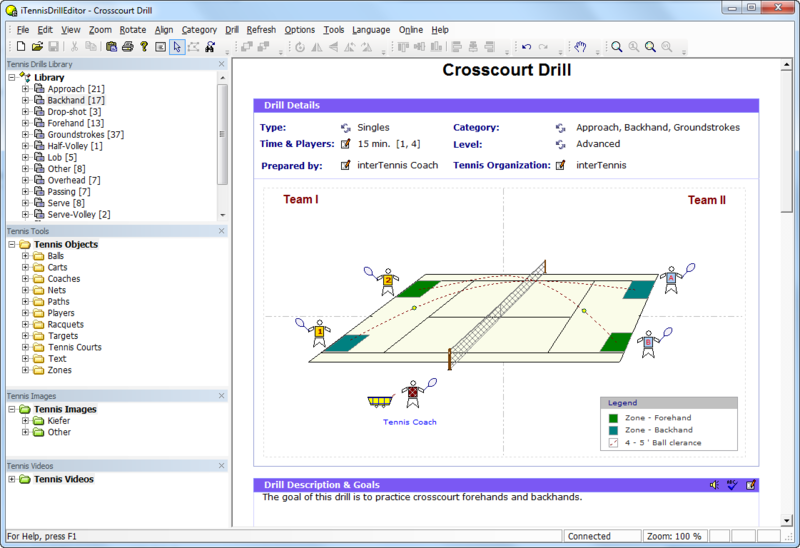 The iTennisSystem also comes with over 100 drills designed by tennis professionals. Drills are categorized logically for easy access. The system makes it very easy to find drills. Simply enter your search criteria (drill duration, difficulty, number of players...) and find what you are looking for. 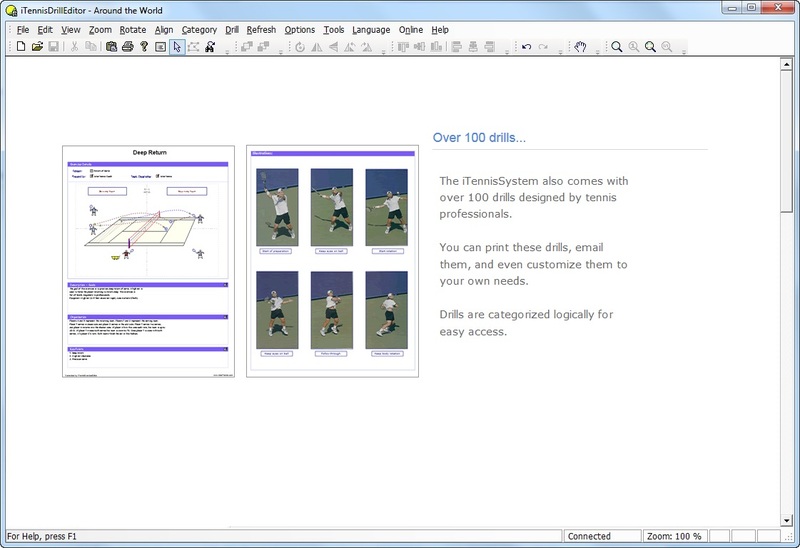 The system includes dozens of tennis tools and images, which you can use to create and customize your drills. You can even add your own images ! 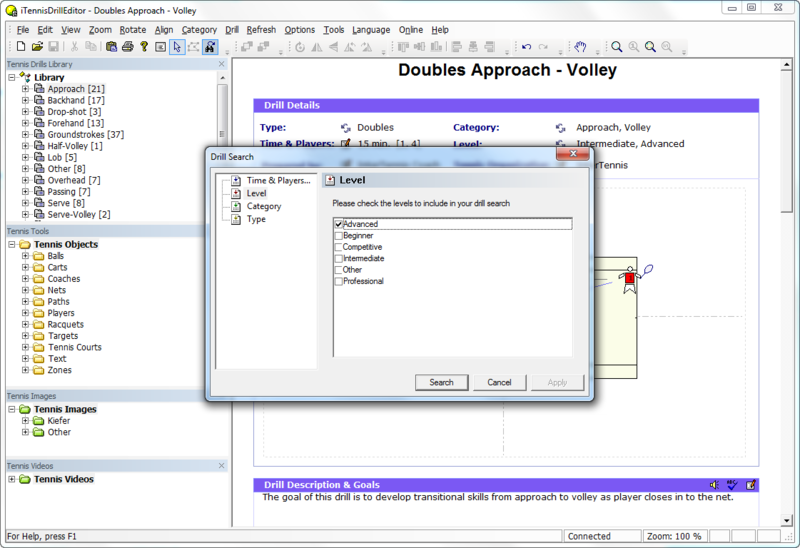 With the latest version of the iTennisSystem, you can enhance drills by adding your own videos. * Shipping cost is added during checkout ! 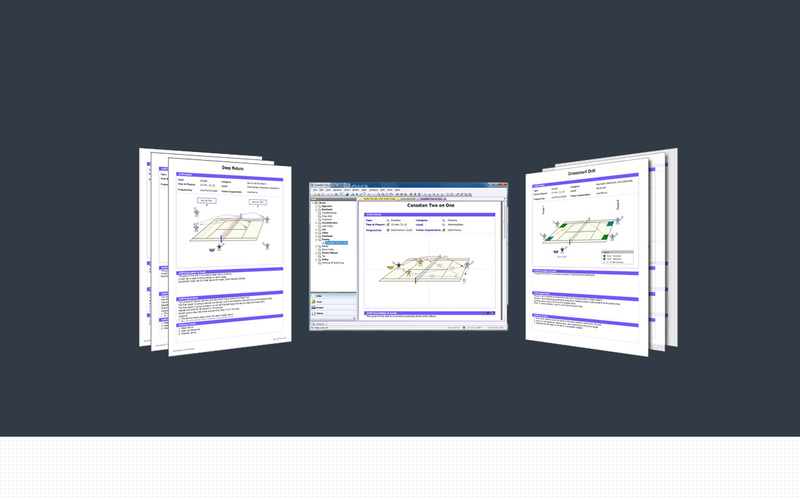 2007 - 2019 © kWare Systems, Inc. ALL Rights Reserved.